It’s the most wonderful time of the year, and by that I mean we are smack in the heart of tomato season. Big, sweet, juicy tomatoes are bursting out all over, and I’m putting tomatoes in every single thing I can think of. And while that is wonderful, what’s even more wonderful is that the tomatoes themselves are pretty great all by themselves with just a teeny bit of garnish…for example, with some good olive oil and some crispy breadcrumbs. It’s a side dish that will make you swoon with tomato love. Start out by heading to your nearest farmer’s market for a few of these. Or maybe you have them right in your own back yard. 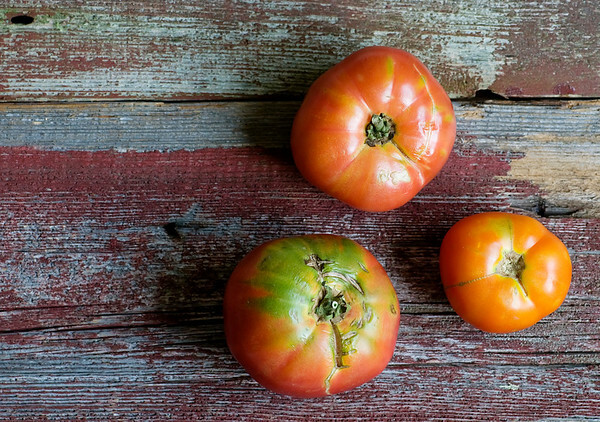 If you can lay your mitts on some heirloom tomatoes so much the better – they may be a little greenish and battle-scarred on the outside, but they are spectacularly beautiful on the inside. I nabbed one of those beauties up there and just ate it like an apple. I had juice running down my chin and I was as happy as happy can be. I restrained myself with the rest of them and sliced them up, and then nestled them into a pie plate. Then I poured some nice olive oil over them and let them have a luxurious olive oil bath for about an hour. Meantime, I toasted me up some delicious golden breadcrumbs – this takes about 5 minutes in a skillet. After my tomatoes were finished with their olive oil bath, I lifted them out of the pie plate (save the oil to use in salad dressing) and put them in a single layer on a serving dish. Sprinkle them with some coarse salt and them press a generous spoonful of bread crumbs onto the top of each slice. And with that, you have just made the perfect tomato side dish for whatever else you are cooking up that evening. Come to think of it, you may not even need to make anything else. Summer tomatoes are just THAT good…I’ll be posting more tomato recipe ideas in the weeks to come! Cut the stem out of each tomato and then slice them into 1/4 to 1/2 inch slices. Pour enough oil over them to come halfway up the sides of the tomato slices. Marinate for 30 minutes, then turn and marinate another 30 minutes. Meantime, make bread crumbs: pulse the bread slices in a food processor until they are reduced to coarse crumbs. Heat the butter in a skillet over medium heat. Add crumbs and saute until golden, about 5 minutes. Season to taste with a little salt and set aside. 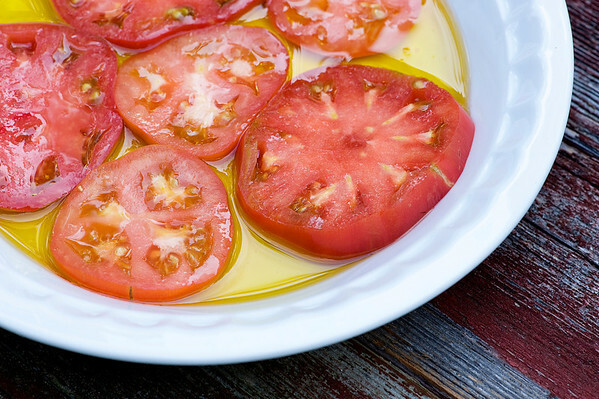 Remove tomatoes to a serving dish (save the oil for salad dressing – don’t cook with it because it will have a little tomato juice in it which could splatter). 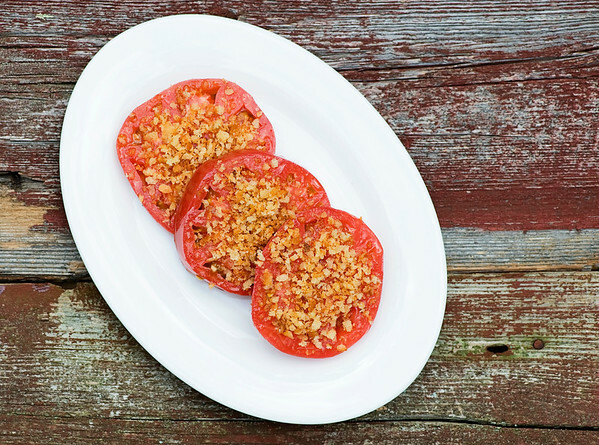 Sprinkle tomatoes with a little salt, press a generous spoonful of crumbs into each one and serve. An olive oil bath…now that sounds like a spa treatment I’d actually WANT. Those tomatoes are living the life. Well, until we eat them. Then WE are living the life! They are! Tomatoes are just plain heavenly in general. coming … gonna enjoy those babies while we’ve got ’em! I will! I have a few more up my sleeve…. Sighhh I love tomato season.. Definitely making these tonight! Hurray! Hope you love ’em! I love tomatoes. I plan on adding them to as much as I can.